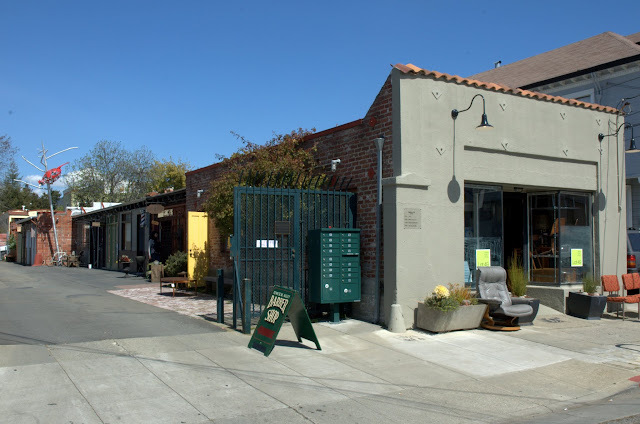 The Temescal neighborhood is one of the oldest neighborhoods in Oakland, and is bordered roughly by highway 24, 40th Street, and Broadway. It was named for Temescal Creek which flows through it, but that's mostly underground these days. The creek was named for the Ohlone sweat lodges that were nearby when the Don Luís María Peralta was given the land by the last Spanish governor of California in 1821. His son, Vicente Peralta, built a modest home there in 1836. Today, Temescal is largely a residential area, with a mix of single family homes and small to medium apartment buildings. But what it's received a lot of attention for in recent years are the quirky shops and burgeoning restaurant scene in its commercial districts along Telegraph Avenue and 40th Street. You can walk, ride a bike, take BART to MacArthur, or an AC Transit bus to begin your walk on Telegraph Avenue near 40th Street. 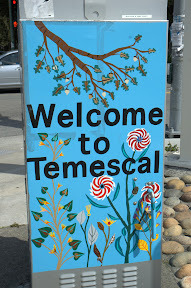 Or click through the photos to take a virtual tour of Temescal. Walking up Telegraph from 40th, the first thing to catch your eye may be the public artwork. These murals are fitting, right outside a paint store at 42nd Street. Keep your eyes open; there's art hiding in some unexpected places, too. There are a number of cafés to stop in for coffee, a drink, or a bite to eat. The first one you'll come to near 42nd is the newest in Temescal -- the bicycle-friendly Arbor Cafe. The next block up includes Remedy Coffee and Aunt Mary's Cafe, so you've got plenty of choices. Or wait until further up the street and try The Mixing Bowl. 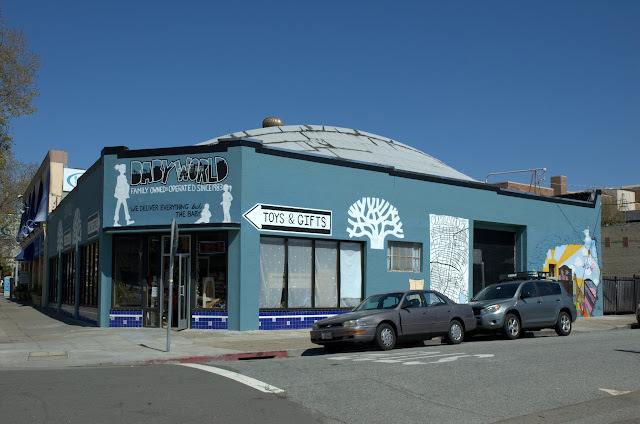 Another business with more public art, Baby World says they deliver everything except the baby. Whether you're shopping or not, you can stop and admire the Oakland oak tree, a map of the neighborhood, and other murals. 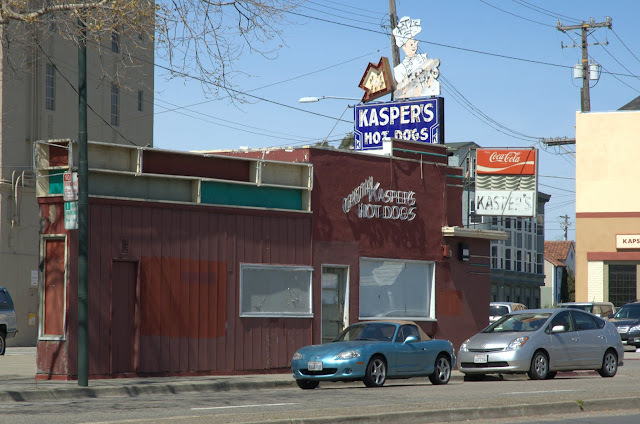 The original Kasper's Hot Dogs was in business from 1929 to 2004. The owner hoped to reopen it, but since that didn't happen, neighborhood supporters are anxiously awaiting a new restaurant in its place. The triangular building between Telegraph and Shattuck Avenue is unique, but on the small side. 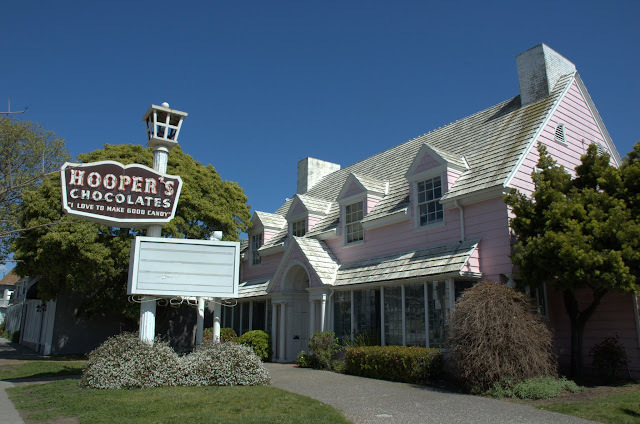 This unusual building was home to Hooper's Chocolates from 1939 until 2010. After they closed, a skateboard shop rented the space for a while. 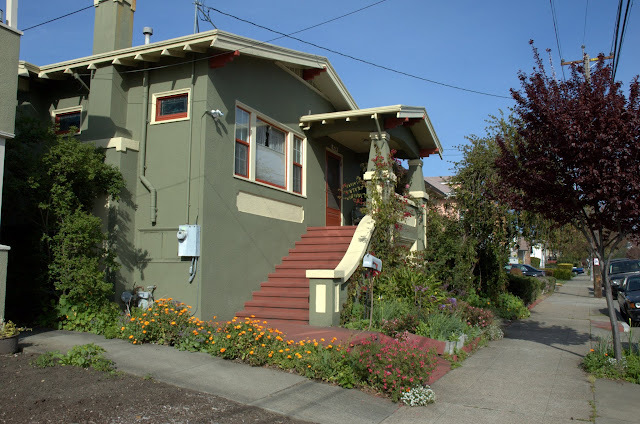 The Cape Cod style is more unusual for Oakland than the color, which has homes in a rainbow of colors. 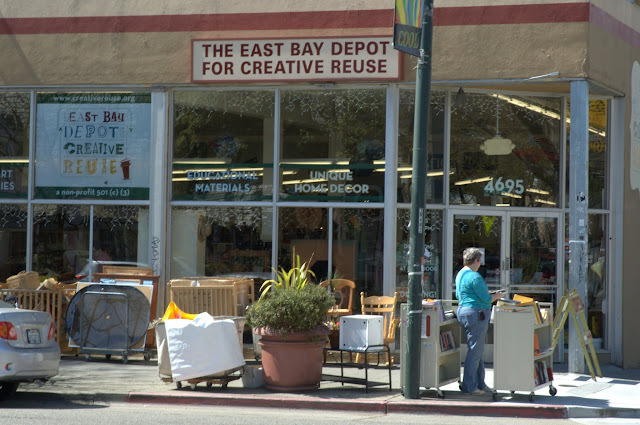 If you're looking for reusable materials for a creative project, The East Bay Depot for Creative Reuse is the place to shop. They also offer discounts to teachers looking for art supplies. The next blocks are full of restaurants, including Lanesplitter Pizza, Burma Superstar, and Pyeong Yang Tofu House. Or satisfy your sweet tooth at Tara's Organic Ice Cream. If you don't fancy any of those options, walk to the next block where there are more choices, including Barlata Tapas Bar and Sura Korean Cuisine. 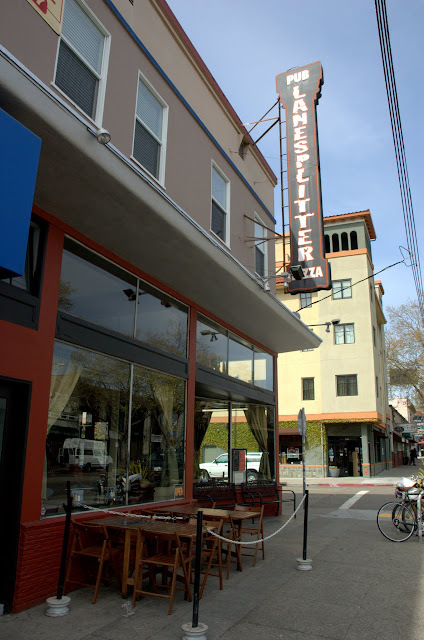 Temescal has a bustling commercial district with a wide variety of restaurants along Telegraph. This section is home to Bakesale Betty, Asmara Ethiopian, Pizzaiolo, and Doña Tomas. Sometimes the lines at Bakesale Betty extend halfway down the block, and there's frequently a wait for a table at Pizzaiolo on the weekends. Be sure to check out the restored G&G Hardware sign. The business is long gone, but the owner of Pizzaiolo liked it and paid for the restoration. 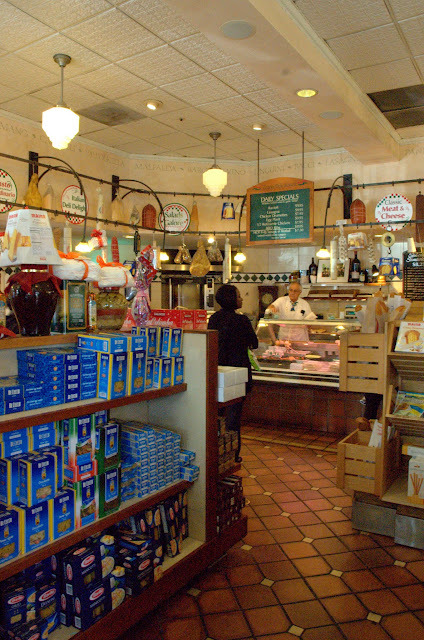 Almost to 52nd Street, you can check out Genova Delicatessen, which has been in business since 1926. There's also a Peet's, a post office, a drug store, and other shops in the plaza shared with the Genova. Heading west on 51st Street you'll see murals on the side of the PG&E substation and on utility boxes on the sidewalk. There's even art on the freeway overpass. 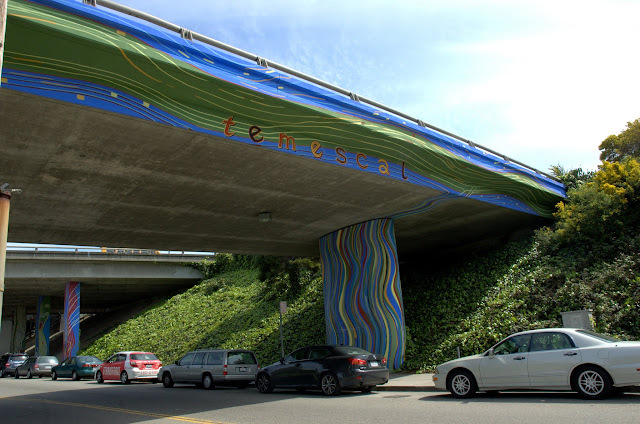 The mural Temescal Flows by Oakland artist Alan Leon was completed in 2011. It livens up the stretch of 52nd Street between Telegraph Avenue and Children's Hospital. 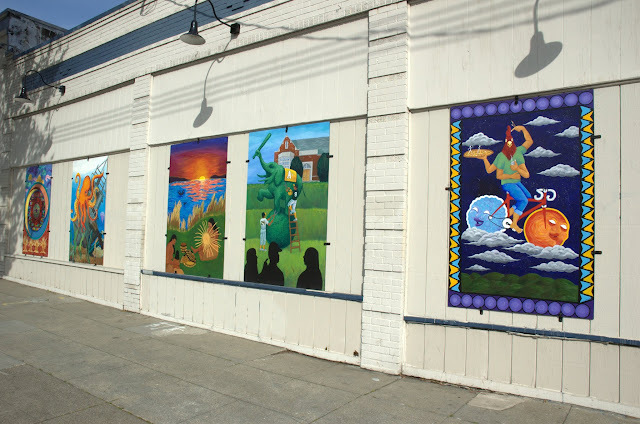 Check out the coverage on the Oaktown Art blog for more photos and information about the mural. 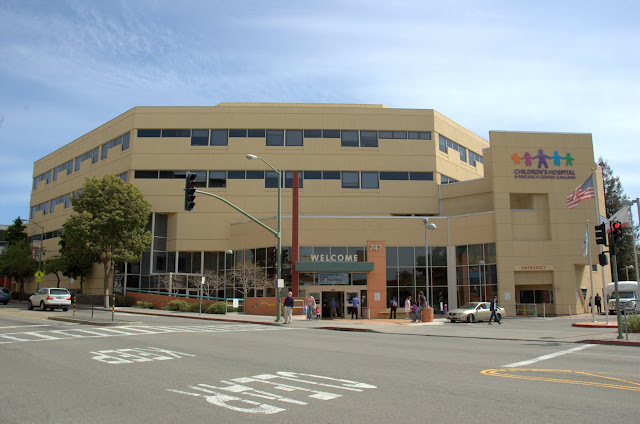 Just past the freeway is Children's Hospital, which is the largest employer in the area. It's been providing world-class medical care and research on children's diseases for almost 100 years. 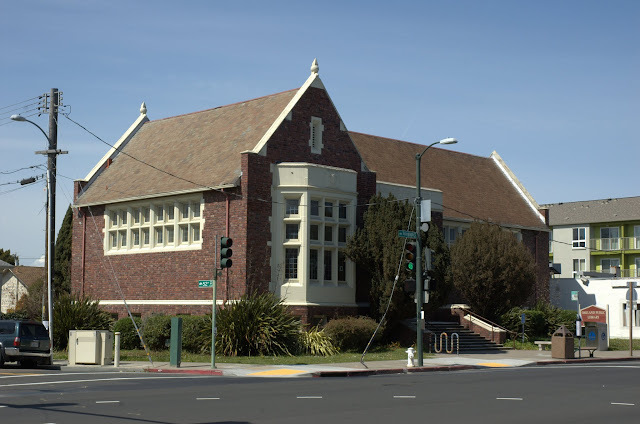 Turning back east along 52nd Street, you'll come to the historic Temescal branch library. It opened in 1918 as the Alden Branch and was renamed in 1948. Besides books and computers, it also houses the Oakland library's Tool Lending Library. Cross Telegraph and take a gentle left onto Claremont Avenue. 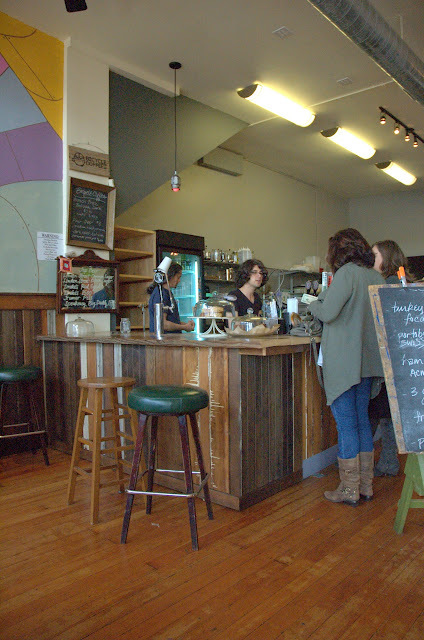 If you're looking to relax with a drink, there are a number of options in Temescal. Many of the cafes and restaurants have good beer and wine lists, but if you're looking for a bar, check out The Avenue or the historic Kingfish Pub. 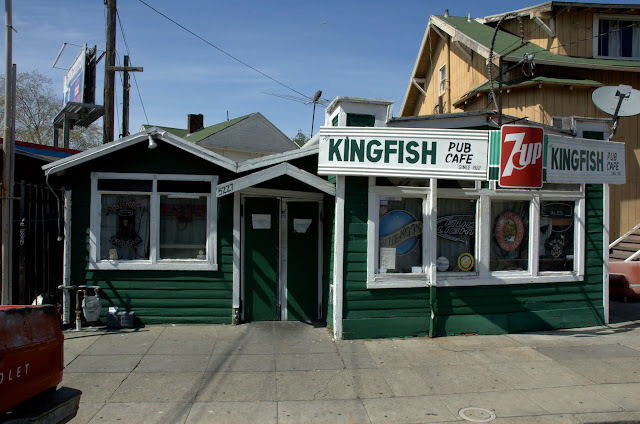 The Kingfish has been around since 1922, and the rustic building interior is covered in local sports memorabilia. Back down at Telegraph and 51st, take a left to head east a little to check out fire station #8. 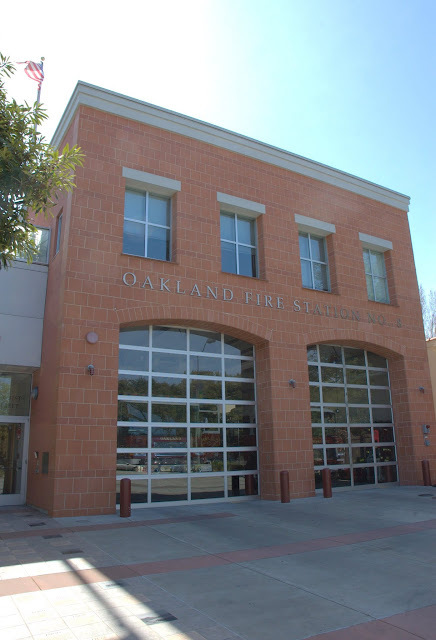 The first fire station back in 1901 was across the street; this modern one was built in 2002. To the left of the big doors, there's a mosaic timeline of Temescal history from the days of the Peraltas to the present. You can come back to Telegraph, or look at some of the nearby homes. On your way back down Telegraph, check out some of the quirky shops and art galleries in Temescal. They include Woods & Wire, The Alley Barber Shop, Esqueleto, Sagrada Sacred Arts, and Rise Above. Most of Temescal is residential, and is full of beautiful older homes away from the commercial districts. Besides small and medium-sized apartments, there are many single-family homes or homes that have been split into apartments. 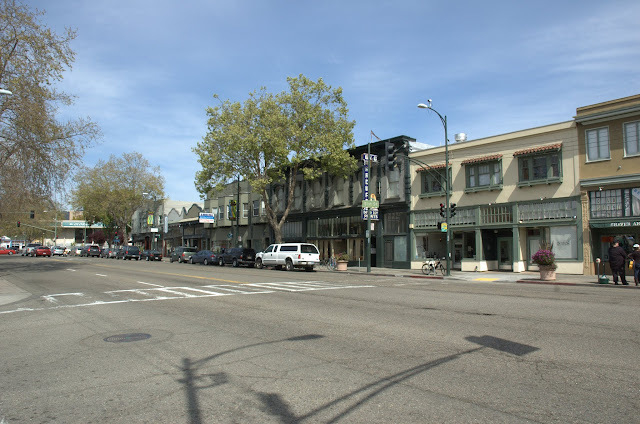 Besides the commercial district along Telegraph, Temescal has several schools, including Oakland Tech High School, Emerson Elementary and Park Day School. 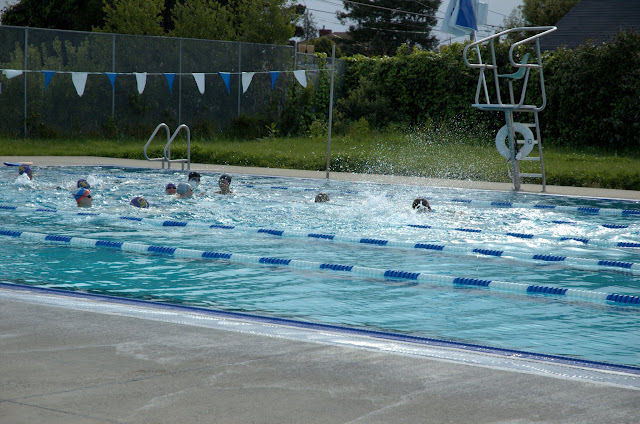 There are other educational resources for students and adult residents, such as the Temescal Pool and Studio One Art Center.